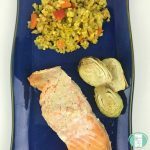 We always like to include a few salmon recipes every time we make freezer meals. Salmon is high in Omega-3 fatty acids. It’s good for brain health. 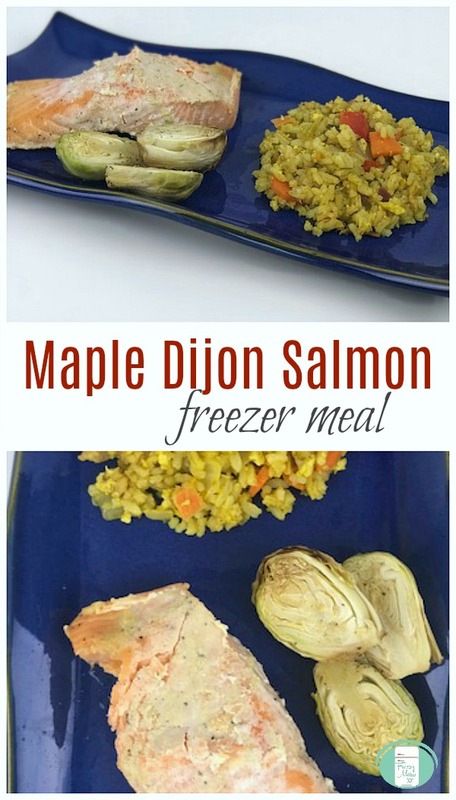 This maple dijon salmon takes just minutes to prepare. There are two salmon recipes that we alternate between and then we always try out one new one. We usually just invent something based on the ingredients we have on hand or what season it is. That was the case with this recipe invention. We happened to have maple syrup and dijon mustard. We thought it sounded like a nice Fall meal. Place the salmon in a large resealable freezer bag. Add the other ingredients. Give it a bit of a mix (squish or shake) before taking out the excess air and sealing. Freeze. BBQ Directions: Create a foil packet using enough tin foil to cover and seal. Cook in the barbeque on high for 7-10 minutes per side until the salmon flakes easily with a fork. Oven Instructions: Place salmon on a foil lined baking sheet. Bake at 350° for 25 minutes. Serve with green beans, asparagus, or brussels sprouts and rice pilaf. Create a foil packet using enough tin foil to cover and seal. Cook in the barbeque on high for 7-10 minutes per side until the salmon flakes easily with a fork. Place salmon on a foil lined baking sheet. Bake at 350° for 25 minutes. Be one of the first to find out when our newest freezer meal plans come out!